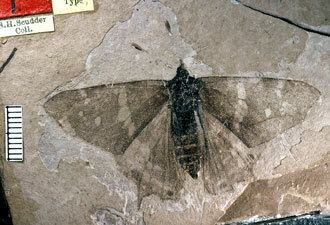 So began the events that led to the formation of the fascinating fossils of the Florissant valley. It's a story full of drama, excitement, life, death, change, and mystery. At Florissant Fossil Beds National Monument, you can explore ancient Colorado as well as the beauty of the modern Rocky Mountains. 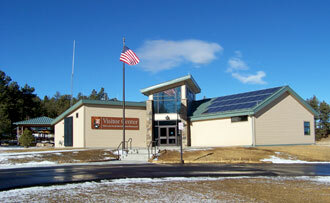 The new, energy efficient visitor center, completed in the summer of 2013, is a great place to start. Here you can watch an orientation film, browse new exhibits, explore the bookstore, and visit with a ranger. Children can pick up a free Junior Ranger book, the starting point to earn a Florissant Fossil Beds Junior Ranger badge. Florissant Fossil Beds National Monument protects one of the richest fossil deposits in the world. Some of the world's largest petrified tree stumps can be seen here. Redwood trees in Colorado you say! You'll find these massive fossils in the outdoor exhibit area behind the visitor center and along two short, self-guided trails: the Petrified Forest Walk and the Ponderosa Loop Trail. Florissant actually means flowering or flourishing in French. And summertime at Florissant Fossil Beds National Monument is bright with bloom. Time spent hiking some of the fourteen miles of maintained hiking trails may bring memorable sightings of majestic elk that live at Florissant or incredible distant views of 14,112 foot Pike's Peak. In summer, the park presents a variety of ranger-led programs including ranger talks, walks, and science demonstrations. Typically, each afternoon, the park staff opens up the demonstration fossil lab where you can have an up-close experience with the shale that yields the area's most amazingly preserved insects, plants, fish, and birds. Yes, science is happening here! 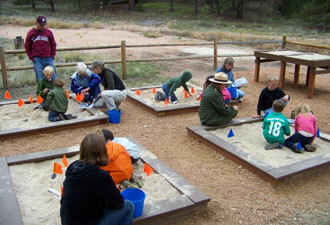 The park hosts an active paleontology program that continues to discover, monitor, and protect the fossils. Not all of Florissant's stories are millions of years old. The Hornbek Homestead tells the stories of early settlement in the Florissant valley. Built in 1878 by a determined woman with four children, the log home stands as testament to their hard work and determination. The five buildings, including a root cellar, are open most afternoons in the summer. A walk around the old ranch can be an enjoyable and reflective experience. Come soon to visit Florissant Fossil Beds National Monument, and don't forget to bring your curiosity!